My desk before “One Day at a Time” management. In early November 2014 I shared my journey of learning to aim for progress, and not perfection. I posted a picture of my desk. In the post I wrote about how eating and clutter are areas of my life I have not managed well without a spiritual approach. I identified lessons I had learned about overcoming perfectionism with regard to food and promised to update you on how I did going forward on applying those lessons to my paper clutter problem. 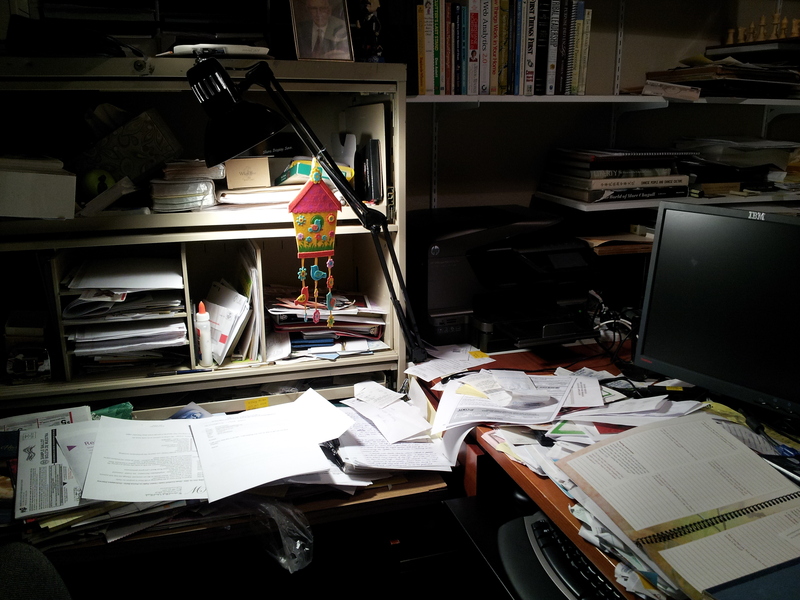 So what can I learn from my success with eating in a healthy way (overcoming perfectionism) that might apply to my problem with paper clutter? I need a spiritual solution to this problem, not an exclusively temporal one. I need to turn to the Lord for His help in developing a plan that is flexible (as appropriate) but effective, not about perfection, but about nurturing myself; creating a wholesome environment in which I can thrive. I need to do the footwork he gives me to do, one day at a time. I need to let go of all or nothing thinking, and be satisfied with “progress, not perfection” (a 12-Step slogan). If I fall off the wagon I need to get back on as quickly as possible. I need to recognize discouragement as a tool Satan uses to keep me from growth and recovery. I need to commit to never giving up. I pondered and prayed about what to do differently than I have ever done before. It is crazy to keep doing the same thing over and over and expect the results to change! I knew that the first thing I had to do was sort and file and pitch and get the work surface cleaned off. I couldn’t even think with that mess. I had no place to work. But I still didn’t know how to prevent the piles from coming back, as they always have in the past. Even though I didn’t have the whole plan, I began working on the footwork the Lord had given me to do – get the work surfaces cleared. It was very hard for me, because I hate doing it so much. I prayed for the power the Lord promises to give us when we walk in faith (see Moroni 7:33). I made some progress, and then during winter break, my wonderful husband gave me a gift of time – his most precious commodity. He gave me a whole day to keep me company and help me get it done. Having done that footwork, the Lord gave me a plan for keeping it clear. I found it interesting that the plan did not come to me until I completed the footwork the Lord had already given me. I did not get to see the end from the beginning. I received the direction I needed one day at a time. Also significant – it was a plan that I had never tried before. “You have made a lot of progress on your desk area this week. I am pleased and proud. One small change in your dailies will keep it that way. Don’t go to bed with stuff out on your desk. 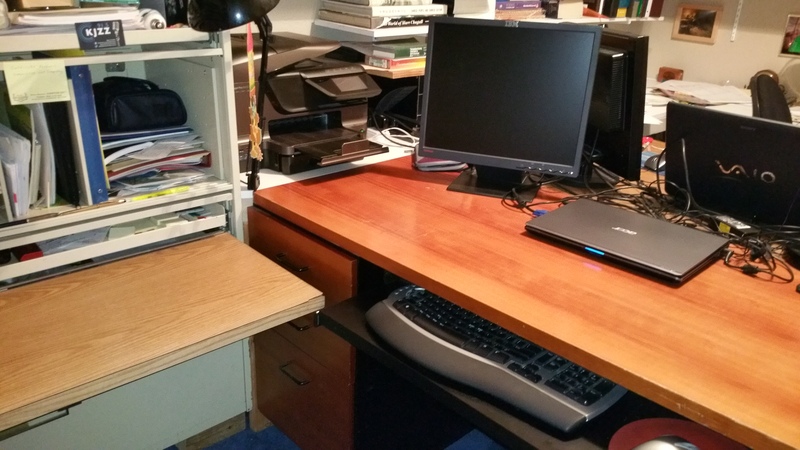 Just the same as the kitchen: after dinner you need to clear your desk. You can have a drawer you use to keep open project work in if you need a place to put it. It could be one of your desk drawers, or the shallow drawer in the credenza. But don’t leave anything out on the work surfaces. You have plenty of file drawers. You know how to use them… Do some filing every day and you will make progress. The big thing is daily incoming mail. If you process it every day you will not get behind again. As you can see from the current picture of my desk, it has stayed clear for three weeks.What is most important is that it feels different this time. Perhaps it is that for the first time I have a real plan – a doable plan – a plan that is flexible and simple. I like having my work surfaces clear. It makes me happy. It brings me peace. I still need to sort/file/pitch boxes of old papers. I know that I can work on it one day at a time. But for now, I am satisfied with keeping my work surfaces clear and processing the mail when it comes in. I am grateful for the Lord’s help on this. I look forward to receiving further guidance and direction from Him. I pray for the willingness to carry it out, one day at a time. Come to think of it, I think I am Changing Channels in this area of my life. Finally. Woohoo! What recurring problem in your life has not responded to all your efforts to find a solution? Are you willing to try a spiritual solution? Are you willing to apply the seven lessons listed above to your problem? Are you willing to take it one day at a time? What action are you willing to take today? I feel so much hope for myself. I have a very similar issue and I feel very strongly that Heavenly Father will help me with my own issues that are on going. I appreciate your sharing this experience and the growth you have made. I am sure others will benefit from your example and sharing. Thank you from me. Wonderful to see this “before and after.” It truly is all about trusting God and taking the first step. Thanks for sharing, Mira. Terrific! This makes me happy and gives me hope for my own improvement.